If you want THE car that gets ALL of the attention at your local cruise night, this is it! One of a kind, Corvair gasser with full custom chassis and a blown 350 Chevy motor. More info on Corvair Gasser. This motor was built right with roller rockers, forged crank, BlowerShop 671 polished blower, coated headers, indexed Holley carbs. Runs strong, Has finned aluminum valve covers and a finned aluminum oil pan. Electric fuel pump, 15 gal fuel cell, electric waterpump, MSD box. Brand new Optima RedTop battery. This killer Corvair was built about 3yrs ago, in Maryland, by a guy with 30 plus years experience of car building. The body and paint was done right. I was told when I bought this car that the builder spent over $34,000 on the build. 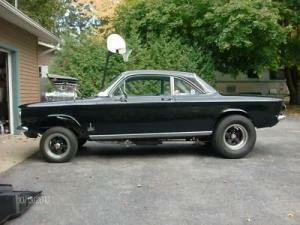 More info on Corvair Gasser.